THE 2018 plant sale catalog and 2018 order form are now available. Note location change: the 2018 sale will be at the Klickitat County Fairgrounds in the exhibit building. 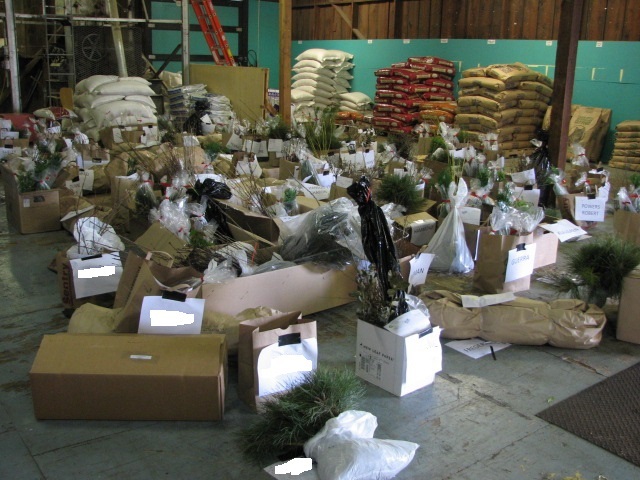 Every year we hold our annual plant sale in conjunction with Eastern Klickitat CD which emphasizes native plants for your garden and landscaping. Plants are available to order starting in January. We try to provide a variety of plants to meet the needs of the public. All plants are marked for the following categories to ease the process of selecting plants. Native Plant – Native plants are those that were present in North America before European exploration. While not every native occurs naturally in every part of the continent, most of the nativeson our list do occur naturally in the northwestern US. Wildlife Benefits – Wildlife refers not only to deer, but other large game animals, as well as songbirds and game birds. It also includes small mammals and reptiles, which provide food for largeranimals and birds of prey. Drought Tolerance – These plants can withstand extended periods of low water availability. Rememberthat all new plantings need extra water for establishment. Pollinator-friendly – These plants are natural attractants for a variety of pollinators, includingbutterflies and bees. They are important to the overall health of the native ecosystem. Fall Color – These plants produce especially colorful fall foliage. Fire Resistance – Fire resistant plants are wise choices for homeowners in the wildland interface. Fragrant – These plants produce a particularly strong and pleasant fragrance. PLANT SIZE DESIGNATIONS Bare root plants are generally identified by age and height. For example: 1-1, 6”-12” indicates a two-yr old plant that has been transplanted after one year, with a top that is six to twelve inches tall. The term “plug” refers to a plant that was grown in a container, then removed for sale with the soil still,intact around the roots. The abbreviation “cu” refers to the approximate volume, in cubic inches, of soil in a plug. Conservation grade plants are designated by the initials c.g., followed by a size (c.g. <9” indicates a plant that is 9 inches or less); these plants are selected based on survivability, not looks. PLANTING BARE ROOT STOCK Keep roots moist and tops shaded while waiting to plant. Plant within 2 or 3 days of receipt or after sweating. Before planting, roots should be soaked 4-6 hours for proper hydration, except for conifers, which should only be soaked for 20-30 minutes. ‘SWEATING’ DORMANT PLANTS Bare root maples, serviceberries, birches, hawthorns, oaks, and potentillas benefit from a process called “sweating. ” For these species, buds become extremely dormant during long periods of refrigerated storage. These must be forced into breaking bud before they are planted, or they may remain dormant in the ground and eventually die. One easy method is to unpack your plants and soak roots in water overnight. Then re-pack in moist packing material, wrap loosely in plastic, and place them in a holding box kept in a warm (60-70 degrees), protected area. Check every few days for bud break and/or mold. Remove mold with clean water and return to packing material. Plant when buds begin to swell or after 2 or 3 weeks of sweating. Species requiring sweating should be kept refrigerated until danger of frost has passed, because once the buds break and new growth starts, they will be vulnerable to frost damage and to drying out. Please keep in mind that plants may be partially or completely sweated during shipment if temperatures are warm while stock is in transit. If your plants arrive with buds already swollen, further sweating is not required.